In Cambodia, one of Asia’s poorest countries, the rapid improvement in internet connectivity and availability of affordable smartphones has been a great leveler. Many of its roughly 15 million urban and rural inhabitants have gained, in a short time, access to mobile internet and social media, which provide relatively free communication and independent, nongovernment sources of information. Some tech-savvy Cambodian activists, like Ngeth Moses, began to harness the internet to foster social change years ago. Ngeth Moses, head of the Media/ICT Unit with the Center for Alliance of Labor and Human Rights in Phnom Penh, has campaigned online through social media platforms for political freedom and human rights causes. Ngeth Moses has also trained dozens of members of NGOs and youth organizations on how to use online campaigning and online expression platforms, such as Open Cyber Talk. In the past year or so, however, the optimism among activists about the positive impact of greater internet access has given way to growing fears as the Cambodian government stepped up efforts to curtail online freedom of expression and political opposition. “I’m more cautious now before posting or commenting [on] anything political online,” Ngeth Moses said, because of the growing state scrutiny of online content and the increase in reprimands or arrests of netizens. FILE - Cambodia's Prime Minister Hun Sen signs a register as he arrives before a plenary session at the National Assembly of Cambodia, in central Phnom Penh, Oct. 12, 2017. At the same time, however, Prime Minister Hun Sen and the ruling Cambodian People’s Party (CPP) have actively raised their online profile ahead of the national elections next year in an attempt to reach millions of new social media users. In early 2016, a new law increased the government’s authority over the telecommunications industry to include “overbroad surveillance powers” that pose “a threat to the privacy of individual users,” according to the U.S. think tank Freedom House. The law includes punishments for several offensives, among them a prison term of seven to 15 years for threatening “national security,” a charge that the local human rights group Licadho said is vague and open to political abuse. A pending cybercrime law is also raising concerns about legal limits on what users are allowed to post on the internet. In 2016, the court used an older law to punish online dissent when it sentenced university student Kong Raiya to 18 months in prison for incitement over a Facebook post that criticized the CPP. The opposition Cambodia National Rescue Party (CNRP) has been increasingly targeted over online statements. Hong Sok Hour, left, a senator from the opposition Cambodia National Rescue Party, is escorted by riot police officers, center, at Phnom Penh Municipal Court in Phnom Penh, Cambodia, Oct. 2, 2015. Senator Hong Sok Hour was sentenced to seven years in prison for allegedly posting false documents on Facebook in 2016. On October 25, King Norodom Sihamoni pardoned him at Hun Sen’s request. Last month, a 20-year-old fruit vendor was arrested in western Cambodia and reportedly charged with incitement and public insult for Facebook posts said to defame Hun Sen and the Queen Mother Norodom Monineath Sihanouk. “The situation of internet freedom in Cambodia is of increasing concern,” said Ramana Sorn, who coordinates the Protecting Fundamental Freedoms Project of the Cambodian Center for Human Rights, adding that the government’s technological ability to collect the communications and social media data from individual users has expanded exponentially. “In the current political climate, social media users must be keenly aware of the risks related to what they are posting and sharing on Facebook and other web platforms,” Ramana Sorn said. FILE - Son Chay is a member of parliament of Sam Rainsy Party and Phay Siphan is a spokesman of Council of Ministers of Cambodia. Government spokesmen told VOA Khmer that the activists’ criticism was overblown and that prosecutions over online content concerned only those who defamed others or posed genuine threats. “We need those multiple opinions, but we do not want those insulting or organizing any subversive campaigns against other people’s reputations — they will face legal consequences,” said Phay Siphan, spokesman for the Council of Ministers. The rising online repression comes, however, amid a nationwide crackdown on political opposition and independent media ahead of the July 2018 national elections. On September 3, CNRP Chairman Kem Sokha was arrested and charged with treason. Hun Sen announced the CNRP would be dissolved, and many party members, including deputy party leader Mu Sochua, have fled Cambodia since the first week of October, fearing arrest. And the U.S.-funded National Democratic Institute was expelled after years of operation. This crackdown, seen as the worst in 20 years, prompted widespread international condemnation and threats of action from the European Union and the United States, but Cambodia, which relies on China’s political support and largesse, appears unmoved. Despite the broad crackdown, millions of Cambodians are now on Facebook and connected through digital communications apps, sometimes encrypted. Experts said any repressive government will find it hard to check the spread of independent information that can inform the public of politically sensitive issues. In 2015, internet/Facebook became the main information channel for Cambodians, with 30 percent of netizens using it to access information, surpassing the more state-controlled TV (29 percent) and radio (15 percent), according to an Asia Foundation report. The improved access to online information “often wakes people up and makes [them] more likely to be critical of the government,” said Mike Godwin, an internet freedom expert and a senior fellow with the U.S.-based R Street Institute. “In fact, efforts to suppress [online] dissent probably will not work as well as they had hoped because they may have the effect of awaking citizens to their unhappiness,” he said. When popular political analyst Kem Ley was assassinated last year, his funeral march in the capital, Phnom Penh, drew hundreds of thousands of people, many of whom reportedly learned of the event through online messages and posts that quickly went viral. 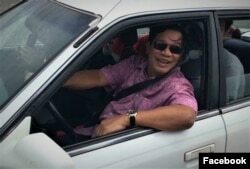 This recent Facebook photo shows Hun Sen at the wheel of a passenger vehicle. Usually, he's driven in a bulletproof SUV. Amid the tightening government control on online dissent, Hun Sen and his CPP have sought to expand their social media use to reach out to the public ahead of the national elections next year. In 2013 elections, the CPP narrowly beat the CNRP in a disputed result. The 65-year-old strongman has urged officials to use Facebook, and he has presented a warm, revitalized image on his Facebook page, which he began in 2015 and has 8.5 million followers. Some photos show him driving passenger cars, attending family outings and frequently exercising. Some researchers have said that the Cambodian government has formed a nationwide program with “cyberunits” run at local levels, which spread countless pro-CPP messages, denounce the opposition and attack government criticism on social media. Ngeth Moses, the tech-using activist, said the CPP’s recent embrace of social media only belied the worsening freedom of expression in Cambodia, as could be seen in the controls exercised over pro-CPP Facebook pages.